You might love paying with plastic, but many business owners wish you’d use cash, a debit card, or even a check instead. If you’ve ever had a hard time using credit cards, you might wonder why some stores and restaurants don’t take them (or even debit cards). 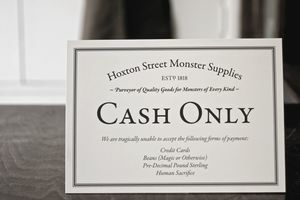 The dreaded phrase “sorry, we don’t accept cards” or a less subtle “cash only” sign suggest that the business owner has particular concerns. You can usually boil those concerns down to cost, certainty, and complexity. Businesses pay fees to accept card payments. Typically, they pay a percentage of each transaction, and they might also face flat monthly charges as part of their merchant account. For credit card transactions, fees are often around 2 percent to 3 percent of your total purchase, bus some cards are more expensive than others. When margins are slim: That might not seem like much, but some businesses only make a small profit on goods and services, and those fees eat into tight margins. Business owners face a tough choice between smaller profits or passing the cost on to customers, and many businesses would prefer to avoid both of those options. Debit cards: Debit card payments are less expensive than credit cards to process, but some business owners don’t realize that or they can’t tell the difference between cards. Others throw the baby out with the bathwater and just require everybody to pay by cash or check. Minimums and surcharges: Some stores try to limit the damage from swipe fees by imposing minimums on credit card purchases or charging customers extra for using credit cards. Merchants aren’t supposed to set minimums or charge fees for debit card purchases, but the lines often get blurred. Credit card rewards: Why are credit cards so expensive? Credit cards offer several benefits that you don’t get with debit cards. Cards with rewards, such as cash back and travel cards, are especially costly for merchants. Those benefits only go to a subset of card users, but the store owner pays for those benefits in the form of higher fees. When viewed another way, all of the other customers subsidize reward card users by paying higher prices. Taxes: You might argue that taxes are another type of cost, and some businesses use cash to minimize taxes. Without an electronic record of every transaction, it’s hard for the IRS to prove that you’re underreporting. This is probably the exception and not the rule, but it happens. Cash is king. When you pay with cash, businesses know that the transaction is complete, and there’s minimal risk of future complications. The money could be counterfeit, but that’s relatively unlikely. Cash is available immediately for business owners to use or deposit. Card payments: When you pay with plastic, it can take several days for the money to become available in a business’ merchant account (especially with a credit card). What’s more, the charges might get reversed in a few months: If the card gets used fraudulently or a customer is unhappy with a product or service, card issuers are quick to issue a chargeback. Check payments: In some ways, checks are safer for merchants because it’s harder for customers to take their money back. Of course, anybody can write bad checks or stop payment on a check, but once the customer’s bank pays on the check (which might take several weeks), it’s hard to unilaterally pull the money back. Instead of clicking buttons or working through card issuers, they need to go through a more “impartial” dispute resolution process. Also, businesses can sometimes get a heads up on bogus accounts or people who frequently bounce checks with a check verification service. Given the issues above, some businesses decide to avoid cards altogether. They might actually benefit from accepting cards, but they don’t feel like figuring out how to overcome the challenges and find the right payment solution. The work required to pick a vendor and choose the best pricing model is just too much. In many cases, these businesses don’t need to accept cards—they’ve got enough business already. That’s a luxury only enjoyed by businesses that offer a unique product that customers love. For example, imagine a taco stand with a line out the front door: Customers are already spending enough, so there’s no need to take on the problems that come with cards. All that said, it’s getting easier and less expensive for businesses to accept card payments every day. Some stores accept plastic, but they’re selective. Most merchants accept Visa and MasterCard, but occasionally they decide not to take American Express and Discover. That’s typically because of the same problems described above—but those issues are amplified with AmEx and Discover. Consumers love their AmEx and Discover cards. But fees for accepting those cards tend to be higher than plain-old Visa and MasterCard. What’s more, it might be easier for customers to dispute and reverse charges with those issuers. Most people with an AmEx card usually also have a Visa or MasterCard, so they could pay with another card if they wanted. Still, some cardholders are so loyal they claim they’ll avoid doing business with merchants that don’t accept their favorite cards. What Is an Irrevocable Letter of Credit? What Rates Can I Get on a Business Line of Credit? What Can a Retail Bank Do For You? What Can Commercial Banking Do For You?